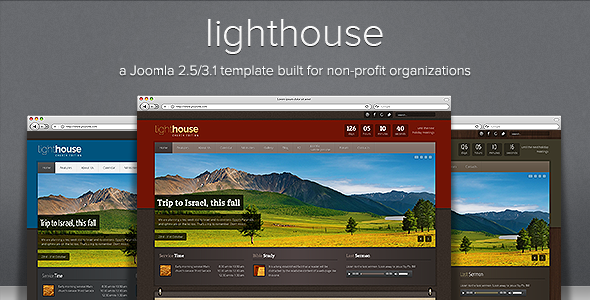 Lighthouse is an intuitive responsive Joomla 2.5/3.3 Template built with churches and non-profit organizations in mind. Lighthouse comes packed with various extensions and an interactive admin option panel. Lighthouse is built on Warp framework, which gives the theme an immeasurable weight of flexibility and agility, fast loading – using built in compression of files, data URIs and gzip magnification. Item Reviewed: Lighthouse - Responsive Joomla Template (Non-Profit Org) 9 out of 10 based on 10 ratings. 9 user reviews.